Efficiency Through Technology – Since I became Register of Deeds we have scanned 12 million pages of real estate records. Every document from the first in 1629 to the last one recorded on Friday has been scanned and is freely available online. When I began the job, it took four weeks to process a new document; now it takes four minutes. Fifty-five percent of all documents recorded today come to us electronically through secure connections from lawyers and banks, making it easier and less expensive for those buying or refinancing homes. Homestead Protection – Massachusetts law allows homeowners to protect the equity in their homes from creditors by filing a Declaration of Homestead at the registry of deeds. I implemented a one-stop process that provides homeowners coming to the registry with the necessary forms, free notary service and homestead recording, all within five minutes. Customer Service – I created a Customer Service Section within the registry of deeds to help anyone with questions about real estate. Whether you present your question in person, by phone or by email, we answer you inquiry promptly and knowledgeably. Your Deed – Do you need a copy of your deed? 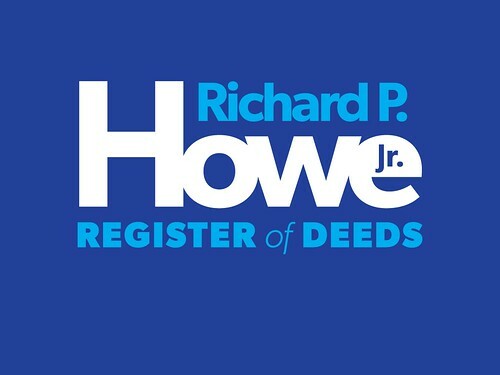 Call, visit or email the registry of deeds. We’ll give you a copy. For free. Legal Judgment – The Register of Deeds is a quasi-judicial official who must pass judgment on documents being recorded. As a lawyer with more than three decades of real estate law experience, I have a clear understanding of what may and may not be recorded and why. People expect solid and fair decisions in these important matters. Cybersecurity – As a former U.S. Army intelligence officer, I have real world training and experience in protecting electronic information. In an age in which everyone holding digital data is a target, these skills are invaluable in safeguarding the electronic records of the registry of deeds. I have done my best to stay informed of the latest protections and threats by regularly attending expert-led sessions and implementing the best practices in the field. Statewide Leadership – As the two-time president of the Massachusetts Registers of Deeds Association and as the author of the Massachusetts Deed Indexing Standards, I have played a major role in standardizing computer systems and registry practices across Massachusetts. I am a regular columnist for the quarterly newspaper of the Real Estate Bar Association of Massachusetts and am a frequent speaker at seminars for lawyers and real estate professionals. The Future – Much remains to be accomplished. In 2019, the registry of deeds will move into the new Lowell Judicial Center. I look forward to maintaining continuity of operations during the move and taking maximum advantage of the new twenty-first century space to further increase the efficiency of the office. I Need Your Help – Middlesex North is a large district consisting of Billerica, Carlisle, Chelmsford, Dracut, Dunstable, Lowell, Tewksbury, Tyngsborough, Westford and Wilmington. With an election opponent this year, I need your help in making my case for reelection. If you’re able to assist in my campaign, please send me an email and please consider making a donation. The era of City Manager Eileen Donoghue began Wednesday morning after the city council ratified her employment agreement at Tuesday night’s meeting. 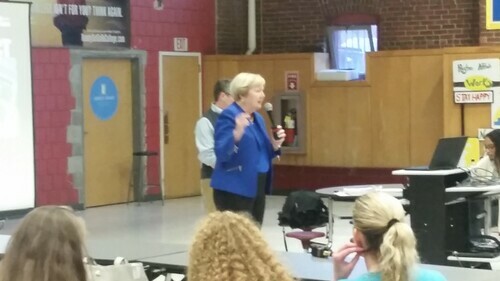 Thursday night, Donoghue was the introductory speaker at the Lowell High School project community meeting held in the school’s Freshman Academy Cafeteria. Before discussing the new high school, City Manager Donoghue provided an update on the existing school which was closed (to students) on Wednesday, Thursday and Friday due to a gas leak in a couple of field house heating units and the subsequent repairs and inspections of all such units. (With this coming week being school vacation, the school won’t reopen until Monday, April 23, 2018). Donoghue reported that the high school buildings were safe. The only leak detected was in the field house which was quickly isolated. Contractors will spend the entire vacation week repairing and servicing all heating units to ensure that they are safe and reliable, not only for the remainder of this academic year, but for however long it takes to construct the new school. The City Manager then turned the microphone over to Bob Bell of Perkins-Eastman, the city’s project manager. 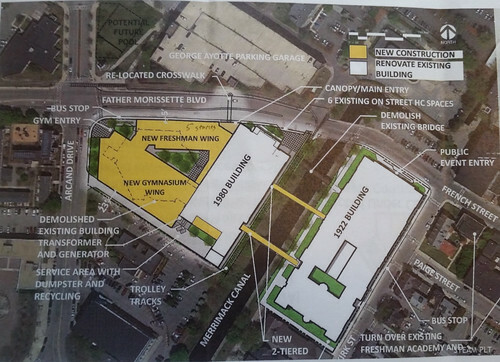 As a result of the city council’s decision to switch from Cawley back to downtown, Perkins-Eastman began a comprehensive review and update of the two downtown “addition & renovation” options (3A which involves eminent domain taking; and 2A which does not). 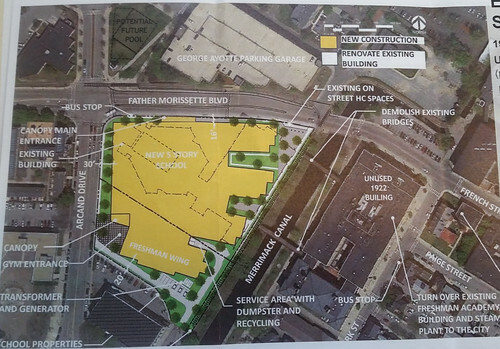 Because the MSBA required Lowell to explore an option for an entirely new school, they looked at that, too. In addition, Bell said that the MSBA has resolved three lingering questions. The first involved the swimming pool, now within the field house which is to be demolished under all three options. There will be no swimming pool in the new building, whatever design is selected. The second issue was the field house itself. The MSBA does not permit the construction of a field house (which is something much larger than a gym). However, the Lowell design team used an innovative approach to get MSBA approval for a “large gym” by some creative design. They started with the largest possible gym allowed by the MSBA, then on one end, added drill space for the Air Force Junior ROTC which is an academic program. On the other end, they added an adaptive PE area. This area will contain specialized equipment and adequate space for students with all levels of disabilities to partake in physical activities. During the day, those three areas will support three separate programs (Physical education, ROTC drill, and adaptive physical education), but after school, the space can be combined into something resembling the size of the current field house. (Bell added that this was a “great victory” for Lowell). The third issue involved the Cyrus Irish Auditorium which has seating for 1200. 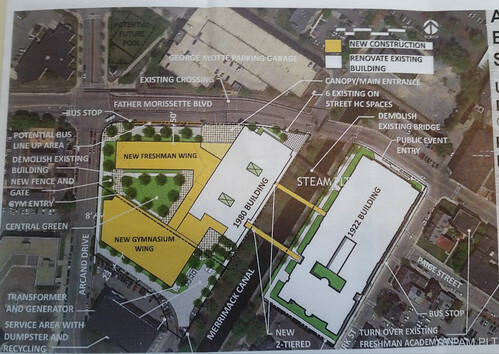 This greatly exceeds anything allowed by the MSBA, but since Options 2A and 3A retain the 1922 building in which the Irish auditorium is located, it would be grandfathered in and allowed. Option 3A is a mix of new construction and renovation of existing buildings on an expanded footprint. This involves taking the “dentists’ office” on Arcand Drive by eminent domain. No temporary gym nor temporary classrooms (“portables”) would be required for this option. That’s because the “new gymnasium wing” would be constructed on the site of the dentists’ office while the existing field house continued to stand. Once the new gym was completed, physical education classes would move into it and the field house would be demolished. Then on part of the footprint of the demolished field house, the new freshman academy wing would be constructed. This would not displace any students since the existing freshmen would continue to attend class in the current freshman academy which is a block away. The remainder of the old field house footprint would leave a quad-like greenspace that could be used for outside activities for gym, ROTC and band. The next phase would be renovating the 1980 building. Classes normally held in the 1980 building would be accommodated in two ways: some would be held in the new freshman wing (which would be vacant since the freshman would still be at the current freshman academy); additional classroom space would be gained utilizing more of the existing classroom throughout the school day. Now, because so many teachers are assigned to a particular classroom, those rooms are not used when the teacher assigned there has an open period. During construction, and also in the new facility, teachers will be more mobile which will lead to more classrooms being used continuously throughout the day. (This is one of the reasons why this option will not require any portable classrooms). Beside the overall interior renovation to the 1980 building, this option would also allow two “light wells” to be constructed through the core of that building to provide now windowless classrooms with natural light. Finally, the 1922 building would be fully renovated although no major structural changes would result to that building. Once all was completed – estimated to take 5 years due to the sequenced nature of the project – the current freshman academy would be turned over to the city. Option 2A is also a mix of new construction and renovation of existing buildings, however, there would be no eminent domain taking, thus the project would be done only on the current footprint of the school. This option would build a new gymnasium and a new freshman wing, but both would be on the site of the current field house. Because the new gym could only be constructed after the current field house was demolished, this option would require a temporary gym someplace. However, it would not require temporary classrooms since the sequencing of classroom construction and renovation described for Option 3A would be essentially the same here. Two things included in Option 3A that would be missing or limited here due to the smaller footprint available without the eminent domain taking would be a greatly compressed green space/quad between the freshman and gym wings. Also because there would be less overall space, it would not be feasible to create the light wells within the 1980 building: the classrooms that would be displaced by the light wells would have to be retained. This option would take 4 years plus one summer to complete. This option would consolidate the entire school into a single, all new building that would be constructed where the 1980 building and the field house now sit (plus the dentists’ office taken by eminent domain). Once this entirely new school opened, both the 1922 building and the current freshman academy would be turned back to the city. This option would take four years plus one summer to complete. It would require temporary gym space plus 24 temporary classrooms. That’s it for the options. April 30, 2018 – Joint meeting of the city’s School Building Committee and the City Council in the council chambers at Lowell City Hall at 6:30 pm. This will also serve as another community meeting. At this event, the designers will present updated cost estimates and the School Building Committee will vote on its preferred option. May 1, 2018 – The City Council will vote for its Preferred Option. May 9, 2018 – The MSBA’s Facilities Assessment Subcommittee will evaluate the proposal at its meeting. June 27, 2018 – The full MSBA Board will vote on the city’s Preferred Schematic Report. Helen Brooks (1921-present) enlisted in the Women’s Army Corps and after basic training, was selected for Officer Candidate School. Commissioned a lieutenant, she worked directly for Army Chief of Staff George C. Marshall at the Pentagon. Taking the Army bus from her barracks to work on her first day, she took the only open seat which was in the rear between two African-American enlisted men. The bus driver refused to move the bus until she moved from the seat. Months later while delivering Top Secret documents to the White House she was asked by President Roosevelt how she liked Washington. She shared her dismay over the discrimination evident in the bus incident. He replied, “It takes time to change how some people think.” After the war Helen, who attained the rank of captain, left the military and worked for the Veterans Administration in Boston. 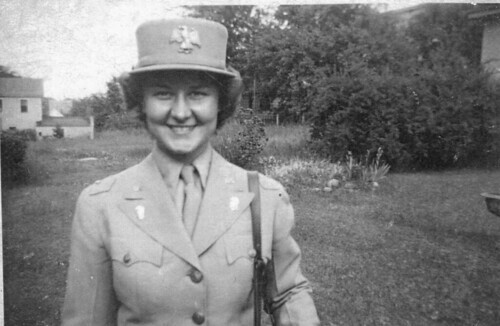 Early in the war, Helen, who was a Lowell High graduate with two years of college, was working for the Army Signal Corps in Boston as a civilian employee. Her work performance was excellent but she could not be promoted because, according to her supervisor, she was a woman and was too young. Helen quit. Helen then enlisted in the Women’s Army Auxiliary Corps (WAACS) which was created by a bill filed by Congresswoman Edith Nourse Rogers of Lowell (and which later became the Women’s Army Corps – WACs). Helen was assigned to Fort Oglethorpe, Georgia, for basic training. The super-serious Lieutenant Colonel looked up from the file in front of her and asked, “Private, do you know anything about the Lowell High Girl Officer program?” Helen replied, “Oh yes, ma’am, I was a Captain in the Girl Officers.” The LTC, who was from Winchester, Massachusetts, smiled and spent the rest of the examination time regaling the two other officers on the panel with stories of the wonders of the LHS Girl Officers program. Eventually, they dismissed Helen without asking her another question. Having been a Lowell High Girl Officer was enough for the U.S. Army, because Helen was placed directly into Officer Candidate School at Fort Des Moines, Iowa. After graduation, she spent some time in an administrative assignment there, but was soon transferred to the Pentagon, where she worked in the personnel office of the Army Chief of Staff, George C. Marshall. I won’t repeat what I included above about her time in Washington. But Helen did add that late on Friday afternoons, General Marshall, who was “very stern” according to Helen, received that week’s casualty lists which he took to the Pentagon courtyard to review. Helen said on more than one occasion, she saw Marshall crying as he read the lists. 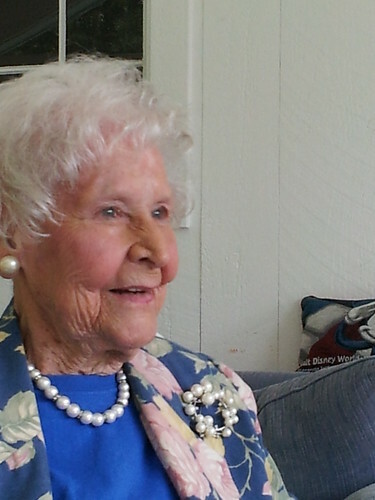 Helen, who grew up at the corner of C and Puffer Street in the Highlands and who was a member of the Lowell High class of 1937, did great service to our country during World War II and was an inspiration to many in the community throughout her life. Don’t forget today’s community conversation on the role of social media, both past and present, in Lowell. The event is at Lowell National Historical Park visitor center, 246 Market Street at 2 pm. 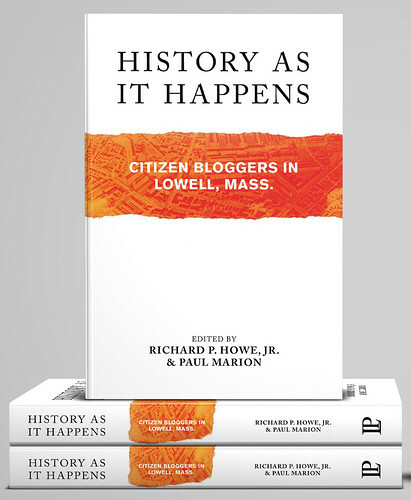 The original co-contributors of this site – me, Tony Accardi, Marie Sweeney and Paul Marion – will lead the discussion and talk a little bit about how this blog and the resulting book (History as It Happens) came about, but we mostly want to hear from others, so please come. It’s free and everyone is invited. 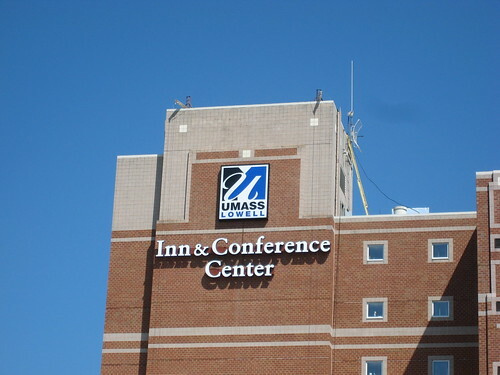 The first Lowell Walk of the 2018 season is this Thursday at 6 pm beginning at the entrance to the UMass Lowell Inn & Conference Center. The walk, “300 Years of History in 300 Yards” will drill down into the history of the area immediately around the ICC, from the pre-colonial Native American settlement of Wamesit, to the rural farming community of East Chelmsford, to Lowell’s peak as the center of the Industrial Revolution in America, to its long decline and recent rebirth. All in 90 minutes; all free. Rain or shine. Just show up! I am so thankful for your service to the people without your blogs and events I would be lost! Another wonderful article by Richard Howe. He never disappoints. Loved reading about dear Helen Brooks. Like Richard’s dad, an inspiration to all.